Those two cards on the far left represent all the cards from 1989 or earlier I bought the entire weekend. Not pictured a 1986 Donruss The Rookie of Bip Roberts -- that's already been sent out, if you know what I mean. 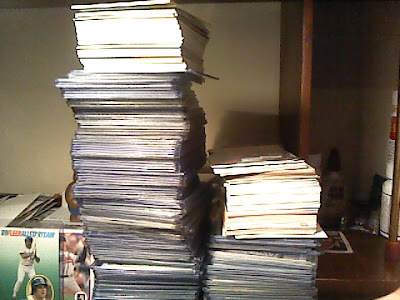 The middle stack are all the 1990s cards, and on the right the 2000s. If tough to find mid-90s inserts were your thing, then this was the show for you. Not depicted: The autographed Michael Vick helmet I'm giving my dad for his birthday (please keep it a secret), an HTA box of 2011 Topps Series One, and a random sack of 2010 Panini World Cup stickers The Cardboard Junkie gave me, that I haven't even looked at.